People are more aware of how their buying decisions impact the world around them and want all industries to commit to corporate social responsibility, especially the technology, food, and fashion industries. 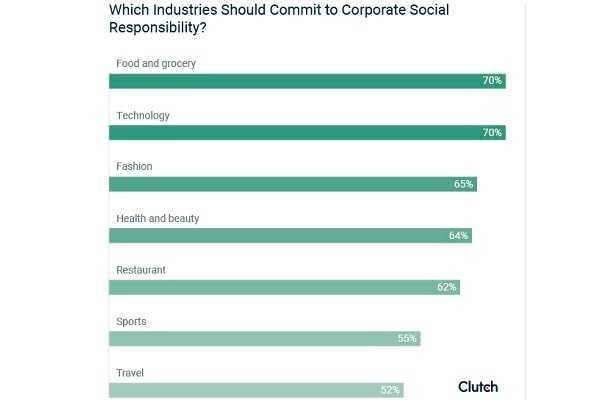 Consumers typically associate the food, technology, and fashion industries with corporate social responsibility, according to a study by Clutch, a leading B2B research, ratings, and reviews firm. People most often cited the food retail (70%), technology (70%), and fashion (65%) industries as those they associate the most with corporate social responsibility. 72% of people say the technology industry should commit to protecting people’s data and privacy. More than two-thirds of people (67%) think that grocery retailers should feed the local community. People expect food-related industries, like grocery retailers (70%) and restaurants (62%), to commit to corporate social responsibility, followed by the technology (70%) and fashion (65%) industries. Among people that expect the technology industry to commit to corporate social responsibility, 72% of those people say technology companies should focus on data and privacy. Michael Gargiulo, CEO of VPN.com, said businesses need to improve security and protect their customers’ data. Businesses also need to be transparent about security breaches when they happen so people are informed. People primarily want grocery retailers (67%) and restaurants (71%) to address local food insecurity by feeding those in need. Chicken & Rice Guys, a Boston-based food truck, saw feeding their local community as a natural social responsibility effort and a clear extension of their brand. “Making and serving hot, delicious food is what we do best, so it’s only natural we focus on issues of food insecurity and hunger within our community,” said Steve Collicelli, business manager of Chicken & Rice Guys. People want to know how the fashion industry manufactures its products and more than half of people (58%) want the fashion industry to use ethically-sourced materials. “In recent years, we have seen increasing interest from consumers in understanding how and where their products are sourced and in supporting companies that use business for positive social change,” said Beth Gerstein, co-founder and co-CEO of Brilliant Earth.